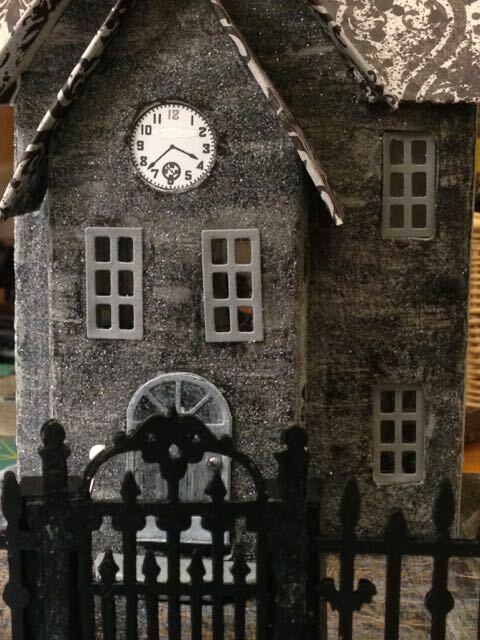 Clock House on a Frost Morn is a Halloween house that I made in 2015 – my first year making little cardboard houses or Putz houses. When I was looking over old photos from previous years, I realized that I never blogged about this house because I think it has some interesting features. What are some of the unique features of this house? 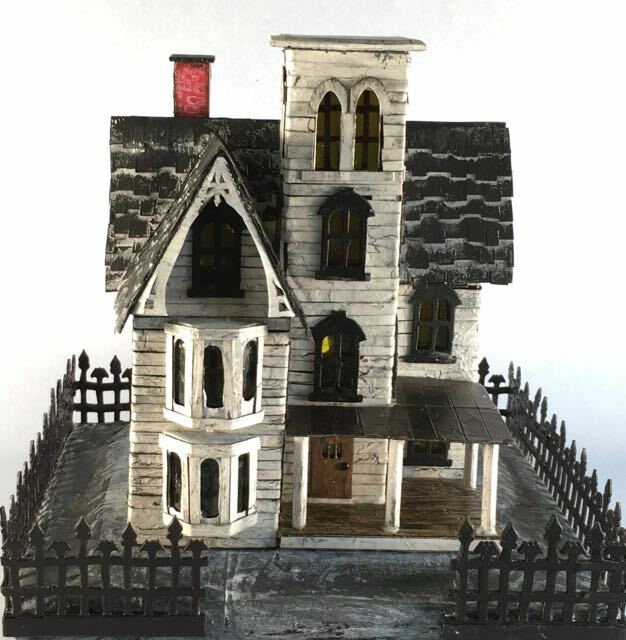 There are 3 main things – the Damask paper-covered roof and the walls which are lightly glittered over streaky black and grey paint as well a fence that completely encloses the house . I don’t glitter many of my Halloween houses, but this house reminds me that it can be very effective for decorating even Halloween houses. The fence completely encloses the house is something I don’t routinely do. And the reason is that my fences consist of several layers of die cuts that I have to glue together. To conserve on the fencing, I fudge a little bit in the back and front so the fence does not extend the whole way across. This house also reminds me that pillars are great for supporting the fencing. Below is a photo showing pins holding the front fence in place while the glue dries. I love this fence. 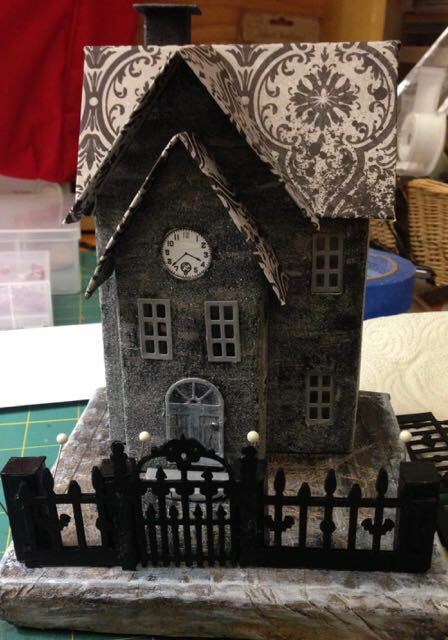 The center gate is from a retired Sizzix die that I no longer have. The bat wing fence is from a retired Martha Stewart punch that is incredible, but I don’t use it much because the fence itself is kind of fragile. The tops of the fence posts have a narrow neck that tends to break and flop over. You know we can’t have floppy-necked fences. There’s a La La Land fence die that I use more often now because I can cut it out of cardboard and glue 2 layers together to make it sturdy. 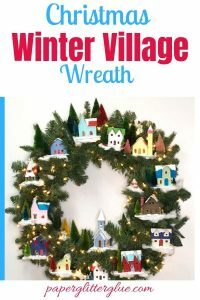 The retired Martha Stewart punch will only cut 65# card stock and takes about 5 layers to glue together to make it somewhat strong. The Abandoned Italianate Mansion has the La La Land fence around it. Abandoned Italianate Mansion with the more sturdy La La Land bat wing fence surrounding it. 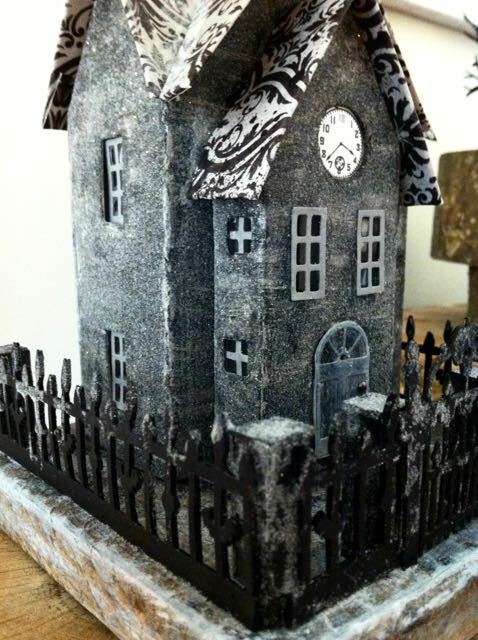 Close-up view of this Halloween house showing the streaky black and grey paint with grey windows. I also used a different window die from the one I use now to make these windows. This die is from Karen Burniston called the Holiday House, but I think it is retired as well. 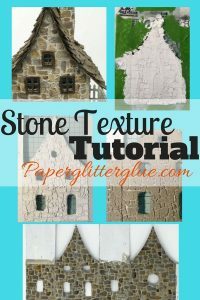 Now I use window dies from the Tim Holtz Village Dwelling series which are larger, but easier to cut out of cardboard. 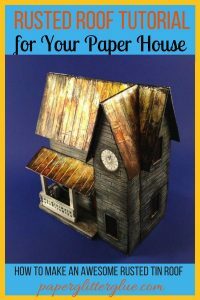 The clock is from Paul Race who hosts the Cardboard Christmas forum – the single best place online to learn how to make little houses. You can find a download of his clock faces here. No Halloween clocks there though, so I used white paint to cover up the Merry Christmas. 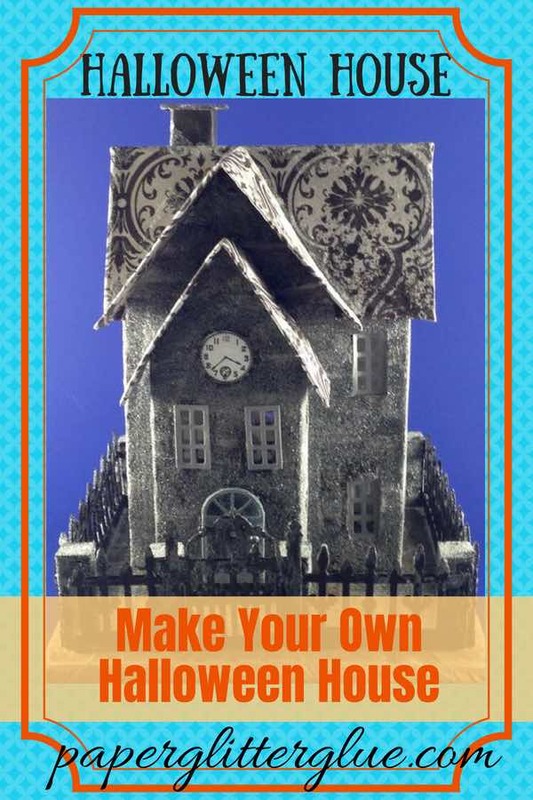 Later I found a 13 hour clock online and shrunk it down to fit my Halloween houses. 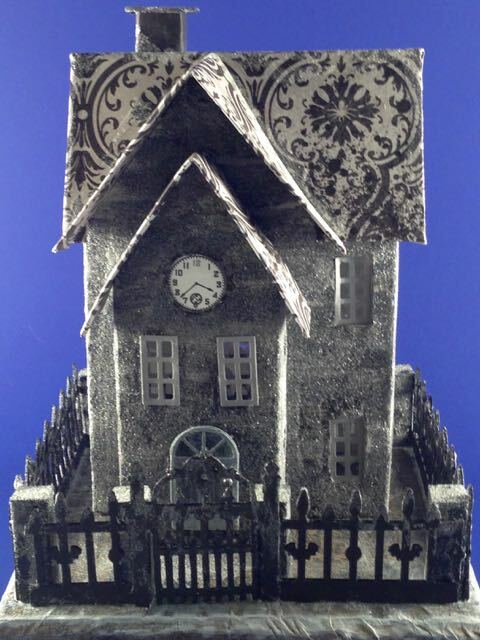 When I made this house, I hadn’t discovered those clocks. I made the base much like the ones I make now – layers of corrugated cardboard covered with paper mache. The paper on the surface consists of crumpled up brown paper stuffing you get with packages in the mail. It’s streaked with white paint and also lightly glittered. Why is called Clock House on a Frosty Morn? Well, the truth is because I didn’t apply the glitter right. Some places the glitter is smooth and consistent and some places have no glitter at all. I decided to pretend that the glitter was the morning frost. And then every house has to have a title so that’s how it came about. 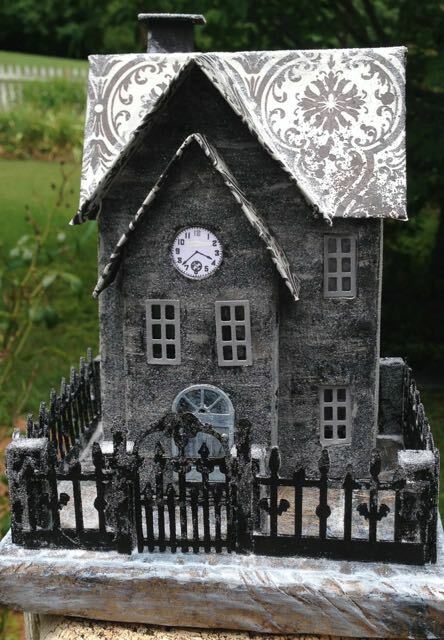 See the erratic glittering on this Halloween house – I am pretending it’s frost, some of which has already melted. 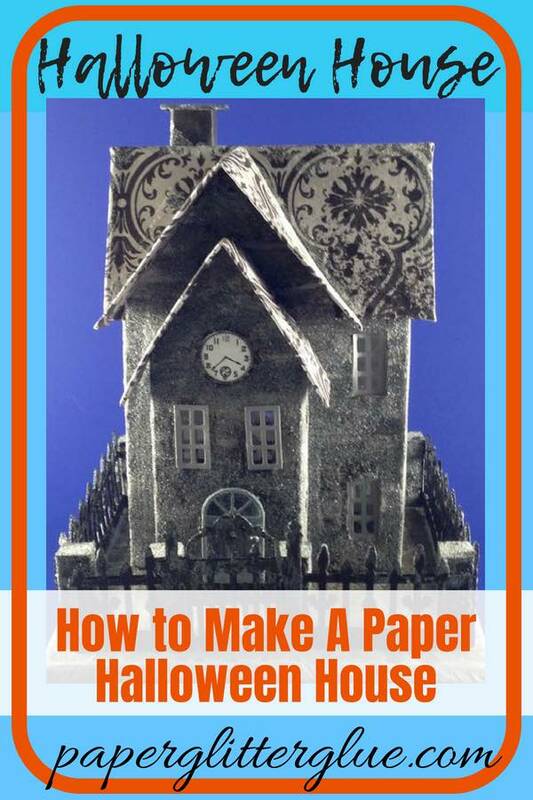 Reminders from Reviewing this Halloween House? So this is just a brief glimpse of a house I made long ago. What did I learn from looking at it again? 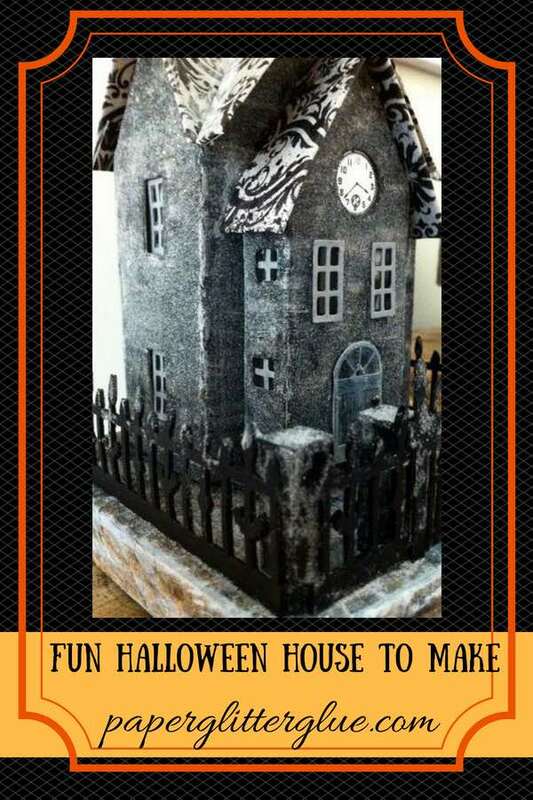 I hope you enjoyed seeing this Halloween Clock House. 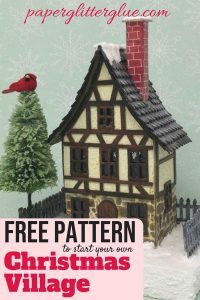 More houses and paper crafts soon including a pattern very similar to this one. 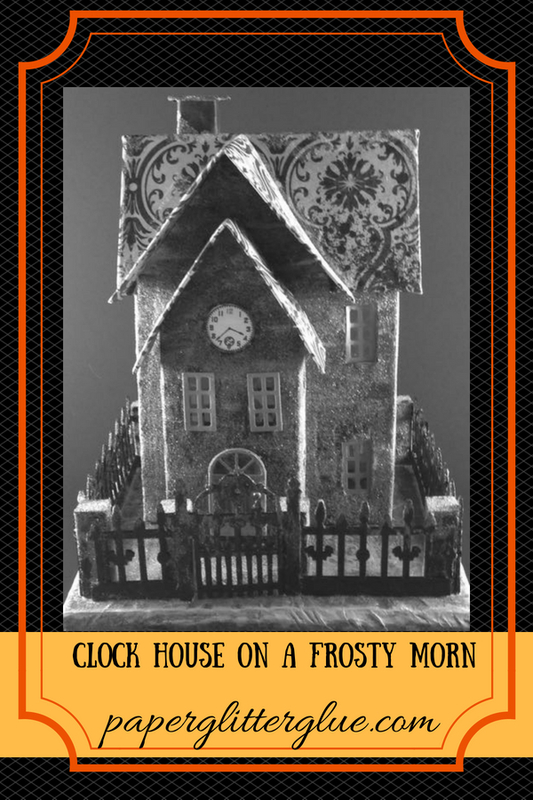 Here are some Pinterest pins you can save to your favorite Pinterest board to remember the Clock House on a Frost Morn Halloween house. Choose the one you like the best. 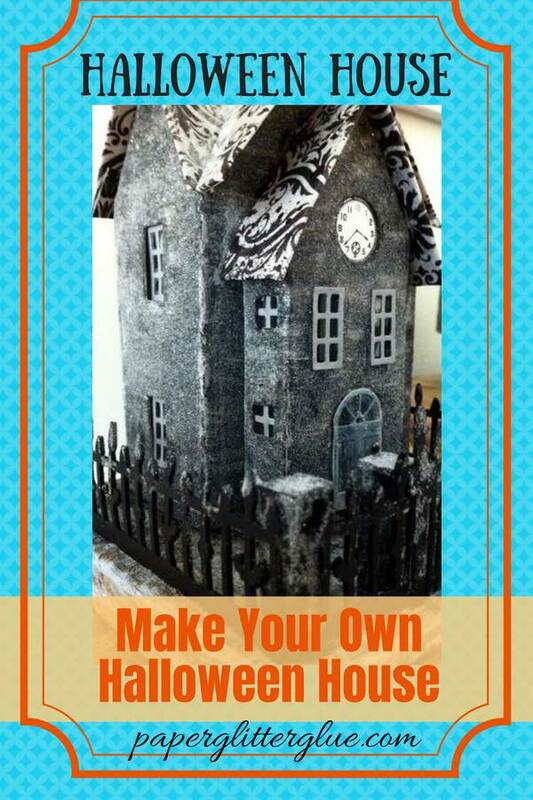 Pin this Halloween House to your favorite Pinterest board.